About a week ago I received an interesting email from reader Steve Kline Jr.
Kline is Director of Market Intelligence at Gardner Business Media, Inc., a B2B media company that conducts surveys similar to the ISM. I own B2B media company that published trade magazines for manufacturing since 1928. Since 2006 we have conducted our own monthly survey that functions just like the ISM index. We get about 500 responses a month from all kinds of durable goods manufacturers. So, it’s a little more narrowly focused than the ISM. But, we don’t seasonally adjust the data. And, I’ve noticed over time that the Fed tends to revise capacity utilization data to reflect the changes in our backlog index. The Fed usually does this six to 12 months after the fact. Basically, in every industry we track there is an accelerating contraction over the last four to five months. Most indices are at their lowest point since late 2012. We do this for metalworking, plastics, composites, and a couple other processes. The metalworking index started in December 2006. The others started in December 2011. There are far more metalworking facilities in durable goods manufacturing than facilities in the other industries. The index can also be broken down by industries (aerospace, automotive, medical, etc. ), region of the country, and plant size. We're working on a data visualization in Tableau for this. I'll put a chart together of the ISM and our index (may take some time as I'm headed to Taiwan for a presentation on the state of American manufacturing.) I will say that one of the participating companies in the ISM has said our index is a better representation of their business than the ISM, particularly over the last two years or so (perhaps due to the seasonal adjustments of the ISM). It is an industrial supplies company. 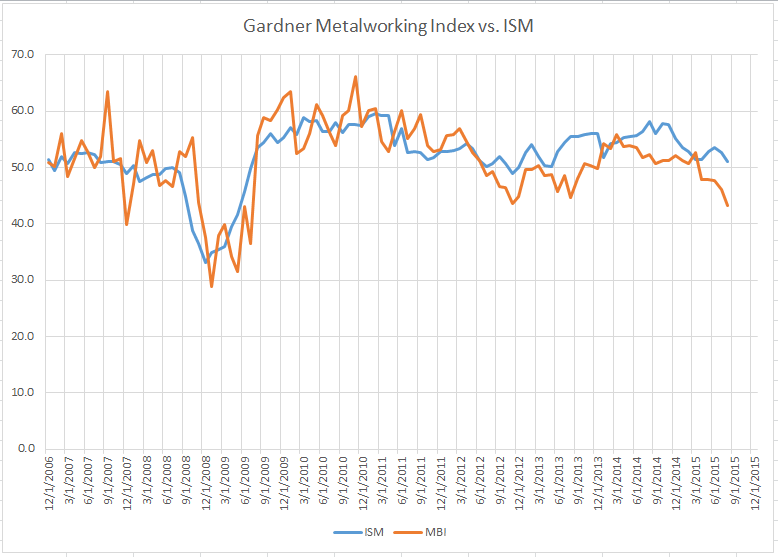 As I said previously, our metalworking business index goes back to December 2006. 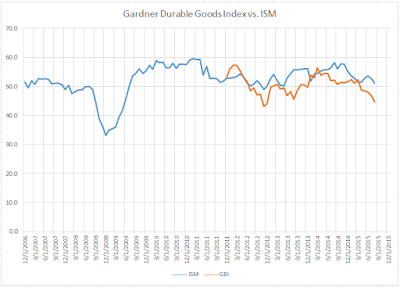 Our durable goods index started in 2001. We have a database of over 100,000 manufacturers, mostly in the durable goods space. Of the manufacturers in our database, more than half are in the metalworking industry. Some of these facilities may do more than metalworking though. 1. We include exports in our total index. While the ISM asks about exports I don't think they include the exports sub-index in their total index. 2. Our survey probably includes many smaller manufacturers that don't participate in the ISM. The ISM is limited to the same 300 companies every month (at least that's my understanding). We send an email survey to every plant we have an email address for. We average about 500 responses per month (about 300 or so in the metalworking index). The responses by plant size are representative of the universe. Since 2012, and particularly over the last 18-24 months, the index at smaller facilities has been much worse than the index at larger facilities. Just in the last two months, the index at large facilities has started to fall. 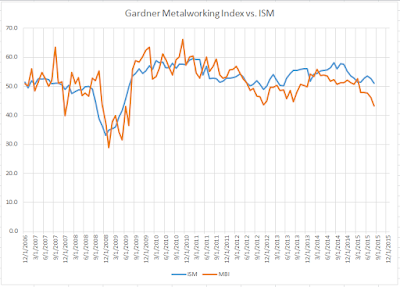 So, it will be interesting to see if the ISM converges with our index again. 3. 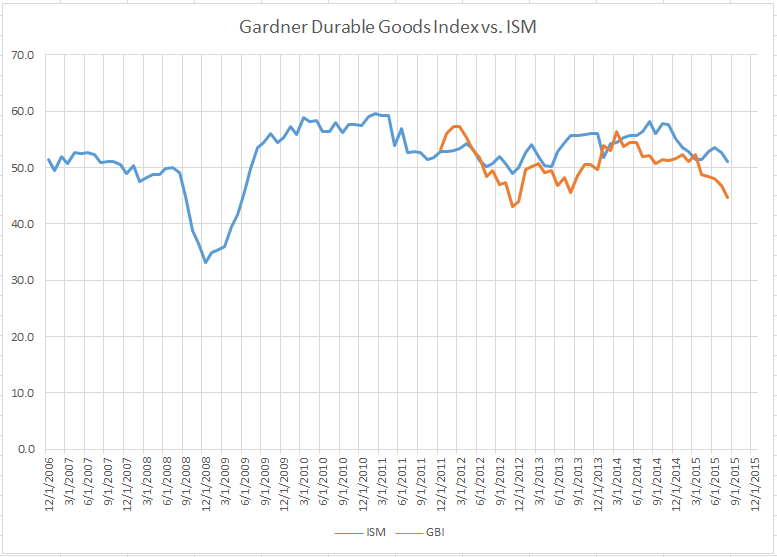 We do not seasonally adjust our data while the ISM does. I seem to recall they adjusted their seasonal adjustment sometime in the last few years. I hope to have a way for those interested to subscribe to this data later this year. It will be interesting to watch how this maps out vs. the ISM over time. I will post periodic updates when I get them.